Steve Kerr made up his mind seven months ago, within hours, if not minutes, of Donald Trump being elected president. And some of his Warriors players were not far behind. Kerr told NBCSportsBayArea.com last November that if the Warriors were to win the NBA Finals, he would not accept an invitation to visit the White House. Those were Kerr's feelings then, but he felt it would be presumptuous to express them publicly during the middle of a season. Now that the Warriors have the championship, taking out the Cavaliers in five games, don't expect that to change. The Warriors are prepared to make a political statement, multiple sources confirmed to NBCSportsBayArea.com Tuesday afternoon. A report early Tuesday morning indicated the team had voted unanimously to boycott any invitation that might come from the White House. Though the Warriors quickly issued a statement later Tuesday morning indicating no final decision has been made, not a man in the locker room or in the coach's office would be comfortable visiting a president who has sowed such division while renouncing civility and from the country's highest office. "Today is all about celebrating our championship," said the statement. "We have not received an invitation to the White House, but will make those decisions when and if necessary." 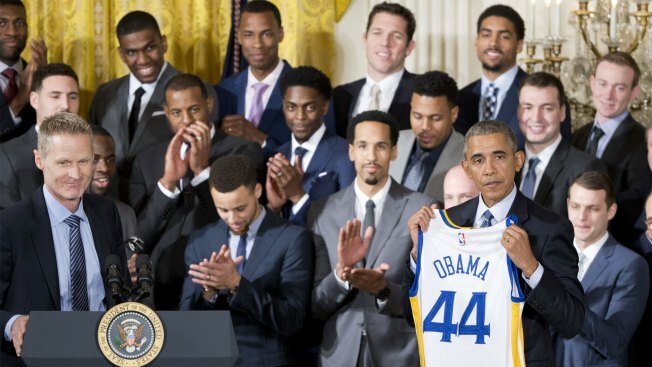 Though NBA commissioner Adam Silver has implied all champions should be honored to receive an invitation from the White House, regardless of the resident, the Warriors -- players, coaches and beyond -- have been clear in disavowing Trump's conduct and policies. Veteran forward David West has been highly critical of Trump and has no desire to visit him. Stephen Curry, too, has been openly critical of Trump and, so far, can't find it within himself to visit a White House where this president is in residence. Veterans Andre Iguodala and Shaun Livingston during the regular season told NBCSportsBayArea.com they would skip the ceremonial visit should the season end with a championship. So while the Warriors, as of Tuesday, were not ready to officially announce a boycott of a potential trip to the White House, expect them to be the first NBA team to pass on such an opportunity. That is, should they receive an invitation.